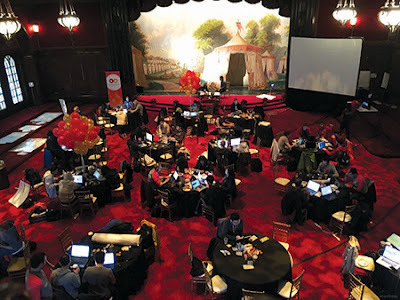 The MasterCard Masters of Code competition is a series of hackathons (an event in which computer programmers and others collaborate intensively on software and hardware development) which traverses the globe and gathers the very best coders. As described by Jay, the 24-hour Grand Finale hackathon was a whole new world to the team as it was an extremely intense yet eye-opening competition among the greatest minds across the world with regional winners from 12 different cities. 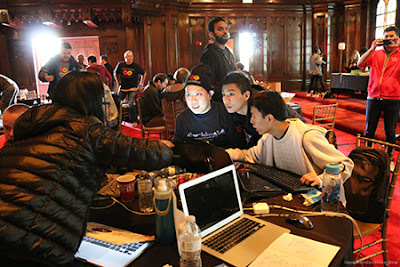 “The overall challenge is to create a real business leveraging MasterCard application programming interfaces (APIs) within 24 hours,” said Jay, adding that all participating teams created their projects based on either one of the themes: ‘Social Good’ or ‘The Next Big Thing’. The ‘Social Good’ theme is about creating a solution for a global problem while ‘The Next Big Thing’ is about creating a killer app, i.e. a brand new technology. The main goal is to seed viable business. The Malaysian Team chose the former option which motivated the creation of their winning project, ‘MoneyRemaid’. Inspired by the everyday casual conversation between Daniel and his maid, MoneyRemaid is a software as a service (SaaS) that uses MasterCard Simplify Commerce and MoneySend APIs to automate salaries and payments through the linking of employers’ credit cards to maids’ bank accounts, aggregate remittances to lower their overall costs, and open up safe investment opportunities with improved interest rates for the workers. In short, the software aims to help domestic workers to better access and plan their finances at a glance. “Our goal is to drive financial literacy and inclusion in Malaysia and the region by helping more than 300,000 migrant domestic workers who are struggling with a lack of financial access and high remittance costs as they send money homes to their families,” explained Jay. The champion team was truly inspirational as they were the youngest participants walking away with the grand prize of USD 100,000 (approx. RM 425,000) to develop their innovation, in addition to the following prizes: two weeks on-site at the MasterCard Start Path accelerator program which will take place in Dublin, Ireland, or an alternate remote location, six months of mentoring from MasterCard, and free payment processing for up to USD 250,000 (RM 1.06 million) in transactions for the first 12 months using Simplify Commerce. 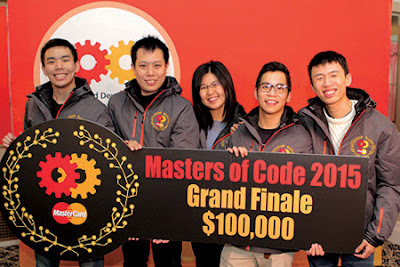 Other than the grand prize, the experience was memorable as they made new international friendships and met top guns of MasterCard who were also judges of the final. For Leonardy, the trip was even more interesting as he personally arrived in San Francisco two weeks before the competition for a half marathon in UC Berkeley. “There I met people who work for the tech industries in the San Francisco Bay Area such as Google, Tesla, and Uber,” recalled Leonardy. Sunway University and Sunway College are extremely proud to have nurtured two very outstanding world class Masters of Code. What’s next? The duo and their teammates will be having good times to reap what they sowed – their grand prize from MasterCard.